Paul Peter Temba served hot breakfast in the mess tent. Introductions came after breakfast at Mti Mkubwa. Robert Mhozya Mtaba gathered all of us in the yard, porters to his left and clients to his right, and called for names. We went around. It was impossible to get them all, but the impression was a positive one. We understood that the Kandoo team was a collection of many personalities; each porter represented much more than hired muscle. Every individual had a name, a specialty, a family, and a story of his own. I wish we could have heard more. But what we heard next was spectacular. The porters treated us to a welcome song in Swahili. 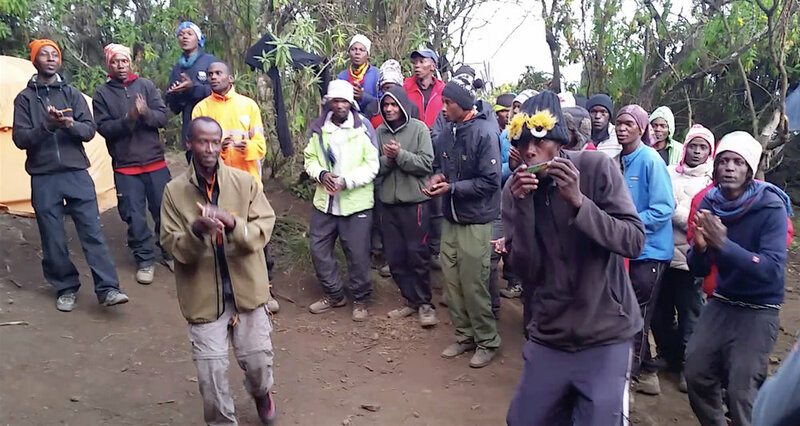 It was a Kilimanjaro version of "Jambo Bwana," a local tune. To our delight, the phrase Hakuna Matata ("No worries!") was repeated throughout. It would not be the first time that I felt as if I was living out "The Lion King" in Tanzania. The only thing we lacked was a meerkat. The Kandoo team was always ready to burst into song. Prosper Willium Mtui, in purple, claps and sings. The welcome song was directed by leaders who alternatively sang, danced, chanted, and freelanced. The group backed the leaders and added punctuation. Through it all, "Harmonica-man" (his given name was Chrispin Gerald Meela) offered accompaniment. What Chrispin lacked in terms of tune or rhythm, was made up for in gusto. As we would learn, in addition to vigorous welcome songs, he could blow softly and accompany the evening breeze. I found it comforting to hear this African Harpo and to see his big grin and silly hat. He spoke little English, but as "tent-boss," it was clear that he knew his business. The camp was securely pitched under his watchful (and fuzzy) eyes. Harmonica-man in his silly hat played along with the welcome song. After the festivities we broke camp and fell into the march. The assistant guides took turns setting the pace. As in the previous afternoon the journey began in dense forest. We climbed, descended, crossed streams, and scanned the lichen-draped trees for the Colobus monkeys. 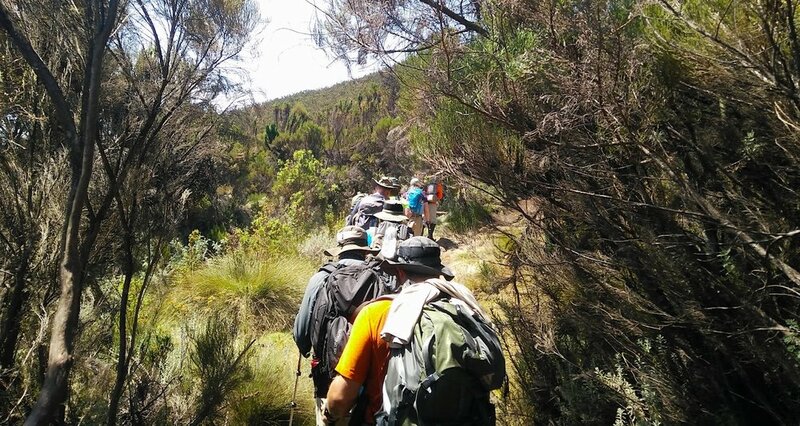 As sweat gathered in my shirt, I was reminded of the observation that climbing Kilimanjaro has been compared to walking from the equator to the North Pole. This was the equator. The montane forest yields to moorland. Photograph by teammember Nico Rogers. In time, the forest exhausted itself. New vistas opened behind the thinning vegetation. Before us the trail curled up the Shira Ridge. To our left, the slope tumbled into the clouds. Our heads and legs knew we were gaining elevation over Simba's African plain. The eyes could now confirm it. The view opened up from the Shira Ridge.